For the sake of transparency—I have to come clean before I tell you just how great the 2016 Accord Sport is. What do I mean? Well, when I’m not cruising around in a cool press-car I can’t afford, I drive my 2012 Honda Civic (please don’t ask the color). Also, my Sister just purchased a 2015 Honda Accord Sport, and guess what she traded in? Yup, a 2013 Honda Pilot, which she got when she traded in her Accord Coupe, which she got when she traded in her Accord sedan. Also, my Dad has a 2007 Accord and Mom a Honda Odyssey. Oh, and how I could I forget about my Grandpa, he has an Odyssey as well. It’s all about the gadgets… Or is it? The following paragraphs will make me sound like a bit of a brat, but it must be told. For some reason I was under the impression my Accord would be equipped with Honda’s latest gadgets; gadgets I’ve been anxiously waiting to play with. Primarily full-LED headlights, but more importantly—Apple Car Play. Oh, and I also love me a Honda V-6 engine. Although a bit disappointed, I was still pretty dazzled by the handsome exterior design and the outright gorgeous 19-inch wheels. So with iPhone cord in hand and ready to plug in to Apple Car Play, I jumped in the driver’s seat. Then, the real horror. I realized this Accord was not equipped with Apple Car Play, and upon further research I realized the Sport trim doesn’t include any of the features I looked forward to. Okay, I’m done whining. After chucking my iPhone cord out the window in rage (jk), I buckled up and set off to run some errands. I didn’t know this at the time, but even though I didn’t get the features I was hoping for, this would mark be the beginning of a new love for yet, another Honda product. When I go for a drive in a new car, I often take mental notes of things I’d like to research once I get home. Then once I get home I hop on the computer and dig for info to digest, which eventually helps me arrive to a conclusion. On the other hand, I constantly pick on Missi for stepping into a car, and within 3 minutes say whether she loves it or not. When I ask the reason why, she says “just because”. Yet, it was me that felt that way this time. The Accord just had a good feel to it, but for the sake of sharing this with you, I had to investigate a little more. Honda, along with Nissan make arguably the best V6 engines in the business, so needless to say I was hoping for one. But the lack of one gave me a new found appreciation for the small but capable 4-cylinder engine. Around town, the engine powers the Accord effortlessly, and although it doesn’t feel weak, it’s certainly not robust by any means, something which is exaggerated even more with a push of the Econ button. I spent a decent amount of time driving Accord both with Econ on and off, and while I prefer it deactivated for a slightly quicker response, I’m a hyper-miling freak, so I’d opt to keep it activated for the extra mile or two it may deliver. 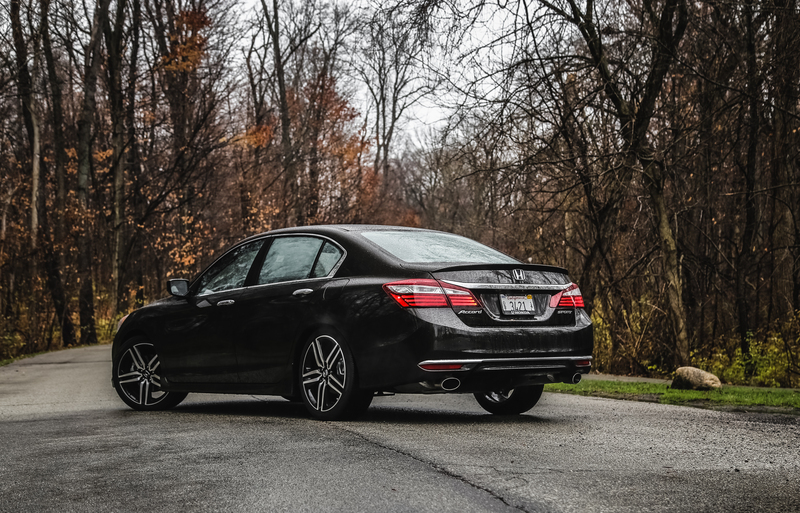 It’s on the highway that the Accord truly feels at home, and that’s the only time when I felt like upgrading to the V6 would be a waste of money, as the 4-cyl really comes alive in the 65-75mph range, right around 3k rpm. 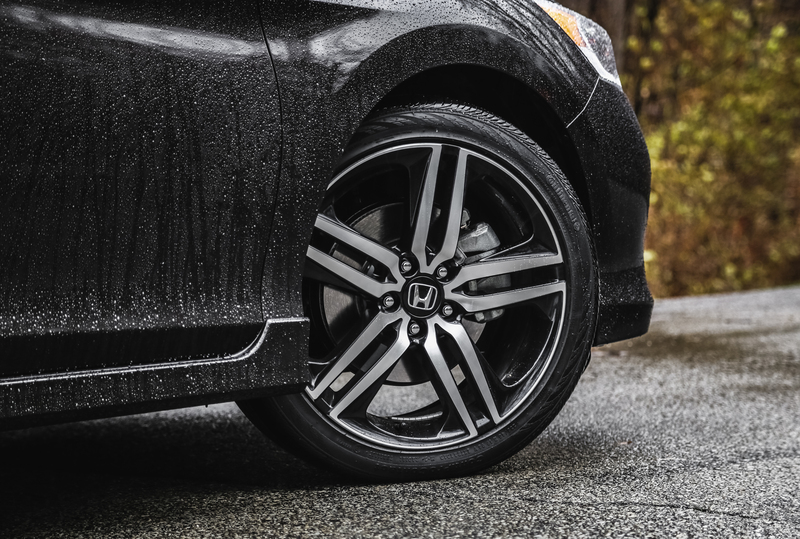 Step on the gas to switch lanes or overtake, and the Accord quickly downshifts from 7th gear and delivers smooth power without feeling any strain. The electrically-assisted steering is soft, yet reassuring, and could very well be my favorite feature of the Accord. Not only is the steering wheel rim thicker than the average, but it’s softly padded, and offers extremely good feedback compared to most electrically-assisted setups. The more cars we we drive; the more the technology, safety and comfort features tend to intertwine and blend each other. In my opinion, they all sort of snowball into the category of family-friendliness. What am I talking about? 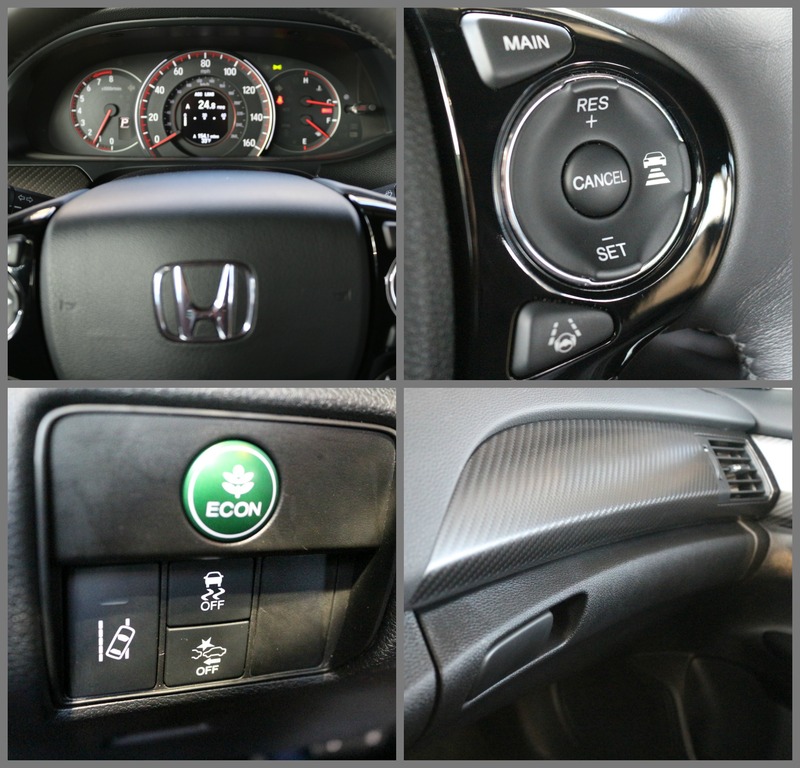 For example: Our test model featured the Honda Sensing package (totally worth it), which includes: Lane Keeping Assist, Adaptive Cruise Control, and a multi-angle rearview camera. All of those are safety features and tech-features, but because all of those make life easier and safer for all occupants, I see them as family-centric features as well. Makes sense? In the end, the fact that the vehicle itself helps me stay on my lane, relax me on a road trip, and make sure I don’t hit anything or anybody while backing up, make the Accord a vehicle I’d be more likely to buy for my family. Having a daughter that needs to ride in a car seat highlights a particular set of qualities in a car, while having another that doesn’t need a car seat, but comes with a lot of other crap to haul around for sports highlights others. 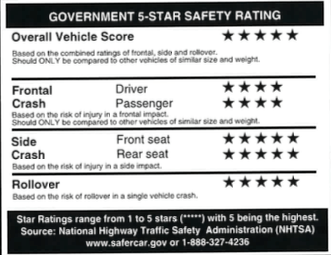 Thankfully, the Accord passes these categories with flying colors. The Accord’s backseat offers two sets of lower LATCH/Isofix anchors, as well as two top tether anchors behind the headrests, therefore offering a maximum capacity for two car seats. 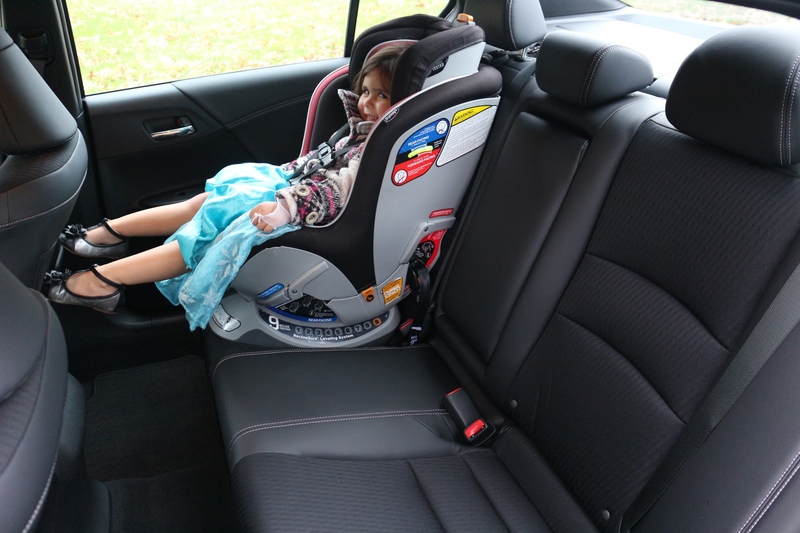 Installing a car seat proved to be fairly simple as the anchor locations are clearly labeled and quite easy to reach. Thankfully there was no need to jam my fingers to hunt down anchors between the seats. My only disappointment in the back seat area were the lack of USB charging ports and ac vents. 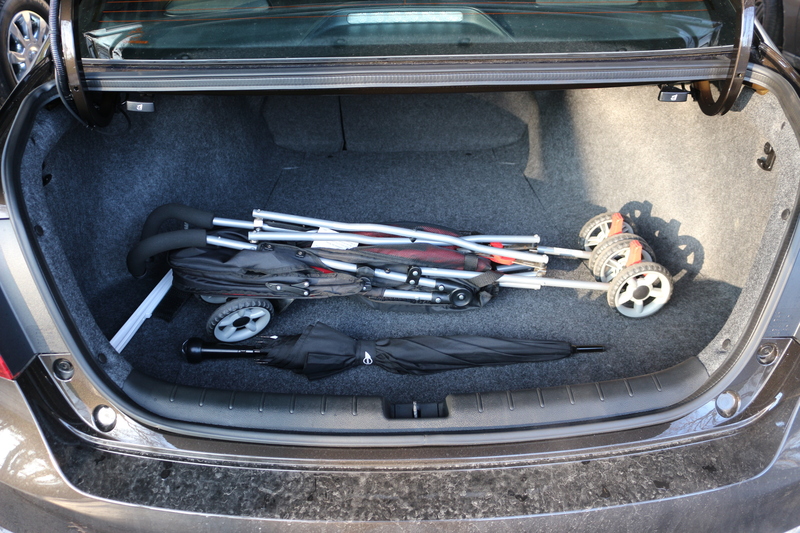 The trunk is pretty massive and offers a total of 15.8-cu ft. of cargo capacity, which translated into real objects means you can stuff a full size stroller, suit case, cooler and other things you can’t leave your house without. While the Accord is no Pilot, it sure can baby! I’m aware this entire piece has sounded like a commercial for the Honda Accord, and fortunately for Honda (and you—the consumer) it’s very similar to my review on the Pilot. It seems that Honda keeps fine-tuning their secret sauce for building great and user-friendly cars. The 2016 Accord is handsome, fuel efficient, comfortable, safe, and our test-model only costs $26,800! That’s seriously good value for a sedan that has everything I could want and need. Really, it’s a heck of a deal. If Honda keeps moving in this direction for the next few years, I can honestly say I’ll join the rest of my family, and trade in my Honda—for a newer Honda. Perfect size for a family of 4. Quite fuel-efficient. Averaged 25mpg city and 32mpg highway. Lack of USB charging ports in rear. Lack of heated seats on Sport trim. I just bought a 2016 Accord sport in Canada it has a Moonroof, Remote Start, Apple CarPlay included. You are getting screwed and I payed the same price CAD! Thanks for reading our review, hope you enjoyed it! Congratulations on your Accord Sport, though keep in mind the car in our review is a manufacturer test car, and not one privately purchased. 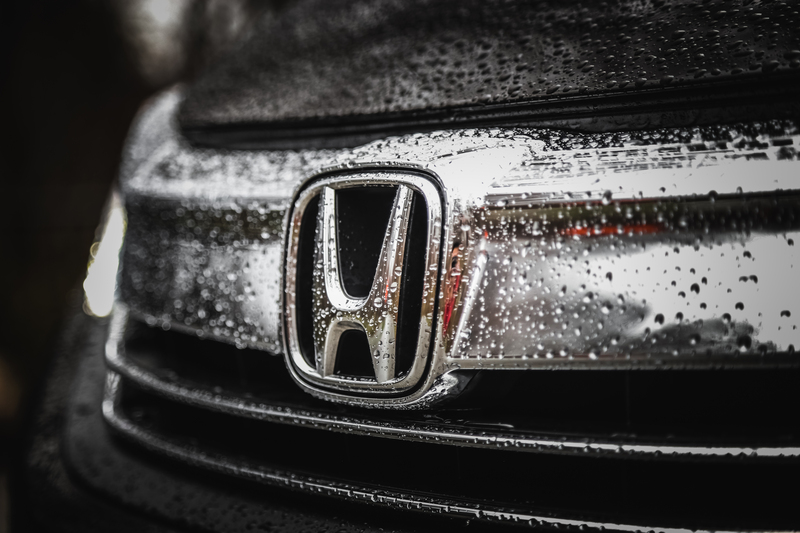 The price mentioned was set by Honda on the window sticker, and can vary greatly depending on dealer pricing and manufacturer incentives, and ultimately some typical haggling. Your Accord surely sounds a lot like mine would look like if I were to buy an Accord! Thanks for reading our Honda Accord story! The Accord Sport is indeed equipped with a CVT transmission which behaves different than a traditional automatic, mainly for the purpose of fuel-efficiency. 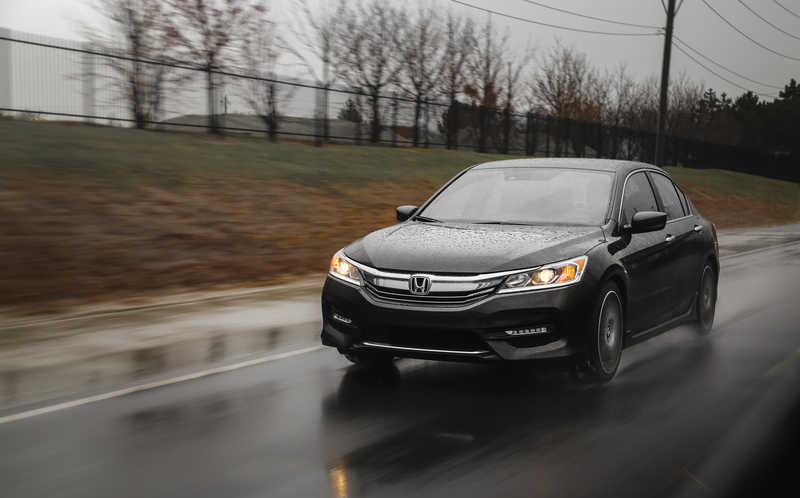 That being said, the Accord, like many other CVT equipped vehicles still have gear selectors which in all reality are “ratio” selectors at the shifter or via steering wheel mounted paddle shifters, which allow you to override the pre-selected RATIO. 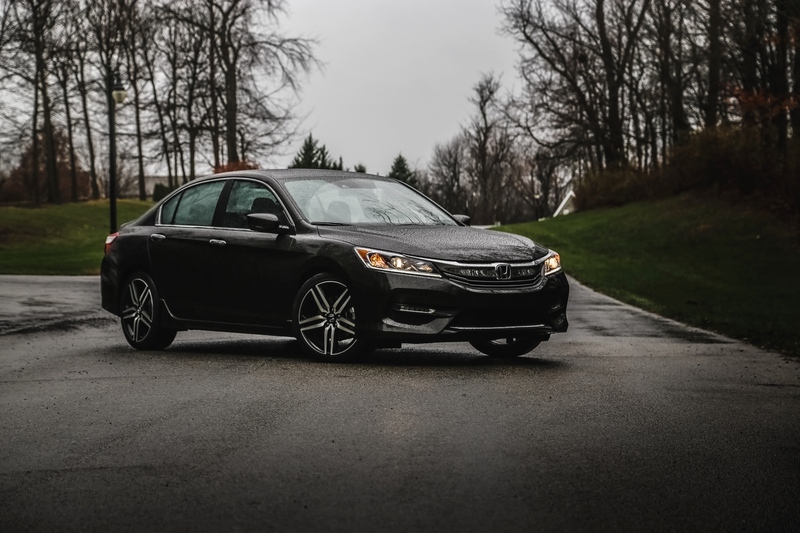 That’s why the Accord can downshift or upshift via its paddle shifters, and that has nothing to do with the fact that it’s a continuously variable transmission. The car will show a number on the instrument cluster which will display the number ratio, and not “gear”. Our blog isn’t gear-head or technical-centric and therefore I used the word “gear” and “downshift”, instead of boring people with technical jargon. I hope that answer is “Honda expert” enough for ya!